I’ve updated my list of services and programs that track changes to web pages at http://www.rba.co.uk/sources/monitor.htm. I’ve copied the list here partly for information but also because I’d be interested in hearing other people’s experiences of using them and recommendations for any services I have omitted. Link checkers such as Xenu Link Sleuth (http://home.snafu.de/tilman/xenulink.html) can alert you to pages that have disappeared or that are redirecting users to another site, but changes to the content are equally if not more important. There are many services that track web page content for changes. Some are free whilst other priced services may offer limited facilities as a free taster. This lists includes both web based services and software programs for PCs and Intranets. This is a free service allowing you to track an unlimited number of pages. The frequency of the alerts can be daily, weekly or monthly and you can choose to only have alerts for “sizeable changes”, when content has been added or removed, or for specific keywords. The email merely alerts you to the fact that there have been changes; you have to click on a link in the email to view them in the Change Detection web site. RSS as well as email alerts avialable. The home page gives the impression that this is a totally free service. It isn’t. The free trial version of this service allows you to track a maximum of 5 pages and lasts for two weeks. You can receive web page change notifications via email, ICG or text message. The subscription services allow you to track more pages and password protected pages. ChangeDetect Personal costs USD 1.95 a month and tracks 10 web pages. ChangeDetect Plus costs USD 14.95 a month for 100 web pages and allows you to set up keyword and phrase notification triggers and colour coded notifications. ChangeDetect Professional costs USD 39.95 a month for 500 web pages with content checked twice-daily. This service allows you to have up to 10 “trackers” and a maximum of 5000 characters tracked for changes free of charge. There are a number of plans that allow more trackers and additional options which can be found at http://femtoo.com/plans/. You can select the content to be tracked and how it is to be treated (text or numerical). Alerts can be delivered by email, SMS and a personal Tracker RSS Feed. Content is checked every 30 minutes. The free service provides 100 daily page checks and 1 hourly check. You can track additions, deletions, Google page rank, keywords, and sections of a page. Alerts are sent to you by email. The Pro account gives you 1000 daily checks, 20 hourly checks, 5 10-minute checks and 100 weekly checks. The free trial tracks up to 10 pages free of charge for 30 days and allows you to associate categories and descriptions with a “minder”. Within the advanced options you can specify how often, in days, the page is to be checked. The most frequent check allowed for free is every 1 day. You can also specify the minimum number of changes that must occur before you are notified and any keywords or phrases that must appear in the changes. Infominder Professional costs USD 30/yr to track 100 pages, USD 60/yr for 250 pages, USD 120/yr for 500 pages and USD 250 /yr for 1000 pages. Infominder Premium allows you to monitor changes up to 4 times a day and costs USD 60/yr for 100 pages, USD 125/yr for 250 pages, USD 300/yr for 500 pages and USD 500/yr for 1000 pages. Page2RSS tracks web pages for changes and notifies you of those changes by RSS. 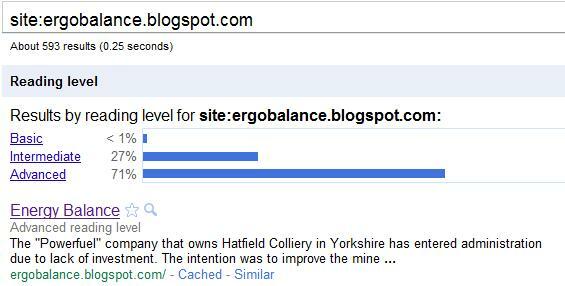 Simply type in the URL of the page you wish to track and then add the feed URL to your favourite feed reader. Excellent tool for pages that do not offer their own RSS feeds. This is a free service run by ATS Consulting, a Norwegian company that specialises in software development. You can track an unlimited number of pages, which can be grouped into folders and tracked on a daily or weekly basis. There is a keyword matching option that filters the changes that are relevant to you, for example if you are only looking for news where a certain term or phrase occurs such as a company or a product name. Channels enable you to divide your pages into groups based on importance or content type. Each channel can have different properties: some can have keyword matching and daily reports whilst others can be checked less frequently and report all changes. Email alerts can include the text that has changed on your pages or just list the URLs of pages that have changed. If you are a professional or heavy user, you are required to pay a fee. Watchthatpage will notify you by email if you fall into the heavy user category. Websnitcher is a free services that checks your pages every 3 hours and gives you a detailed list of changed textareas. Email notifications are sent once a day and it also generates RSS feeds from the collected data. It alerts you only to what it considers are relevant changes; the intelligent filter tries to ignore changes in date and what it thinks are irrelevant textareas such as how many users are online. Copernic Tracker is a tracking program that costs US $49.95. Once installed on your PC it enables you to track any number of pages on external sites and intranets. You can track changed words, new links or images. There is a useful advanced query form for tracking specific words within pages, Boolean and other search operators (AND, OR, NEAR). Copies of page revisions are stored locally so that you can compare changes that occurred in the past and add your own notes for tracked pages and each of their revisions. There are four pre-set tracking schedules: Multiple Times per Day, On a Daily Basis, On a Weekly Basis and On a Monthly Basis. Alerts can be a tray icon, desktop alert or notification message, SMS notification, email report with the tracked page contents and changes highlighted. As well as general changes to a page you can track the page for the appearance or deletion of specified text, or track selected areas of the page. You can view changes from within the program or in your browser and be alerted via email, a pop-up on your desktop or a sound. The default checking frequency – minutes, hours or days – can be changed as can the frequency for individual pages. Price: 29.95 USD. 30 day free trial. Update Patrol checks pages for changes as often as you like and you can monitor single pages or entire web sites. It costs US $69.95 for a standard license and US $129.95 for the pro version. See http://www.updatepatrol.com/editions.html for details of the features supported by each edition. A free trial is available. A free add-on for Firefox. To monitor a page, display it in Firefox and from the right click menu select Scan Page for Update. You can select how often each page is to be scanned (from 5 minutes to once a week), whether or not to ignore numbers, and if insignificant changes are to be ignored (specify the number of characters from less than 10 to less than 1000 characters). An alert will pop-up at the bottom of the screen when changes are detected. Click the blue up-arrow on the bottom status bar to display the Update Scanner sidebar and pages that have been updated are shown in bold. Click on a site in the sidebar to view the page with highlighted changes. The full version of this software is available on a 30 day free trial. It tracks an unlimited number of pages and you can choose to ignore HTML tags, images/banners, numbers and dates. You can enter user names and passwords for password protected pages that you wish to track. Pages can be checked once a day, once a week, or on a specified day or days of the week. You can even specify the checking frequency during a day either in hours or minutes. You can track entire sites without having to specify each page individually (not available in the Basic Edition). As well as web pages you can track RSS and Atom feeds, but this feature is not really a replacement for a fully fledged RSS reader if you are a serious news junkie. Prices are 29.95 Euros for the Basic Edition, 49.95 for the Personal Edition, 99 Euros for a single user Business licence, 1990 Euros for a site license and 9990 Euros for an enterprise licence. Google has rolled out a new search option that assigns a reading level to the pages in your results list. Don’t be surprised if you haven’t spotted it yet; it is hidden on the advanced search screen. Under the “Need more tools?” section you can choose from the drop down menu to see all of the results with reading level annotations, basic results, intermediate results or advanced results. Google does not give much away as to how it calculates the reading level and it has nothing to do with the reading age that publishers assign to books. It could involve sentence structure, grammar, the length of sentences on a web page, the length of the document, the terminology used and doubtless many other criteria. But Google isn’t saying. If you have opted to see the annotations, at the top of your results page you will see a graphic showing the percentages for each of the categories. Under the title of each entry in your results list is the reading level. Click on the Basic, Intermediate or Advanced links next to the bar chart to see pages for that reading level. The eagle-eyed amongst you will have spotted that Google appears to be mathematically challenged because the numbers do not add up to 100%. In all of the searches I have done so far 1 or 2% are missing from the statistics. Looking through the lists of results some pages have no reading level assigned to them and they seem to be documents that contain very little information, have more numbers than text, and some are formatted files. Note, though, that most file formats do have a reading level so why some are not picked up remains a mystery to me. Some Daily Mail articles do not have a reading level either but many would argue that they fall into the ‘very little information’ category! Once you have used the Reading Level in the advanced search screen you can change your search on the results page and it remains as part of your search strategy until you close down your browser or tab. (http://philbradley.typepad.com/phil_bradleys_weblog/2010/12/google-adds-reading-level.html). He also highlights some potential problems with labelling pages in this way. For example ‘basic’ does not necessarily mean stupid, but some people may be deterred from selecting basic pages because of the tag. Most of my pages are classed as intermediate and I am happy with that. Many of them are listings and analyses of business information sources. My husband’s blog on the other hand is 71% advanced and 27% intermediate. This comes as no surprise to me as he has a habit of littering his postings with complex calculations on topics such as wind turbine energy generation and the EROEI of tar sands oil production. (Just the sort of thing not to read before you have had your second cup of coffee of the day.) That plus the industry specific jargon that he uses makes an advanced tag inevitable. The evidence so far seems to be suggesting that using terms or jargon that are relatively uncommon in the whole of the Google database is a heavy factor in determining the reading level. Let’s look at what one might consider to be an intellectually challenging topic: the use of zeolites in environmental remediation. That seems to confirm it. 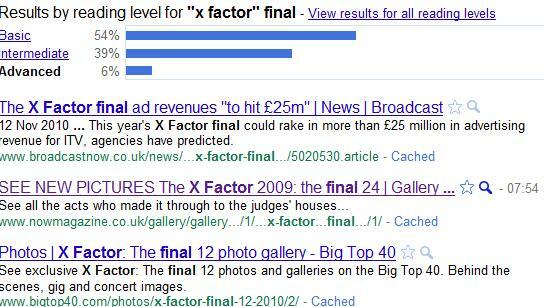 As a final test and for a bit of fun let’s look at what Google makes of a search on the recent x Factor final. Noooooo! Surely some mistake? 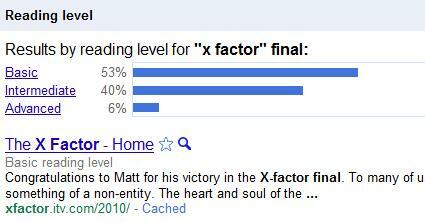 The X factor home page is rated as basic but 93% of the results are advanced. There is indeed a mistake but it was my sloppy search strategy. Changing the x factor part of the search to a phrase gives what I would expect and a switch to 53% basic, 40% intermediate and 6% advanced. Out of curiosity, I looked at the content of the advanced pages and am now totally bemused. I cannot see how they could ever have been classified as such, but then this is Google we’re talking about. Perhaps Google cannot comprehend the scoring system, why so many people watch it or why the programme exists at all? I have experimented with several other searches. Some came up with results as bizarre as those for the x Factor search but it is interesting how the breakdown can be changed by slightly modifying your search strategy, for example by using phrases when appropriate or a plus sign before a term to force an exact match search. 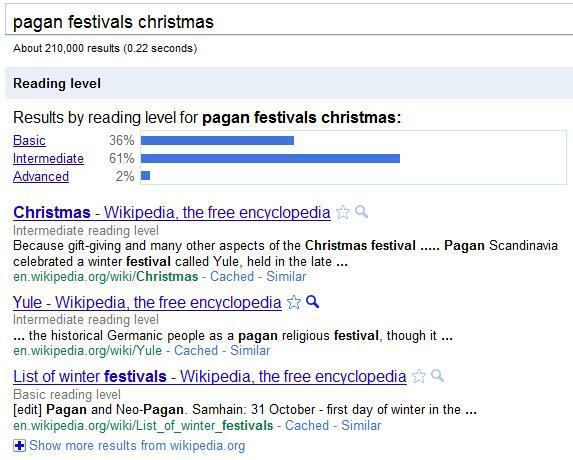 Google’s Reading Level could be useful as a training tool to show how small alterations to a search strategy can radically change the results. But as with all things Google, we do not know how it works and the results can sometimes be very strange. Use with caution. PNC Wealth Management’s annual review of their Christmas Price Index (CPI) has revealed that this year True Love will have to pay USD 23,439 for his gifts, an increase of USD 1,974 on last year’s prices. The CPI was started in 1984 and surveys the cost of the gifts given by True Love in the song “Twelve days of Christmas”. In 1984 the cost was USD 12,673.56. “In general, Internet prices are higher than their non-Internet counterparts because of shipping costs for birds and the convenience factor of shopping online” Dunigan said. If you have not already spotted the links on Twitter, Facebook, LinkedIn etc to the various presentations I gave at “Online” in London earlier this month here they are all in one place. I gave two talks as part of the free seminar programme that was part of the exhibition, a conference presentation and a pre-conference workshop. They all have a Creative Commons attribution non-commercial license assigned to them (see http://creativecommons.org/licenses/by-nc/3.0/ for further information on the license). Google’s New Search Features: has it gone too far? This presentation was given in the exhibition area as part of the free seminar and masterclass programme. I have added comments to some of the screen shots so that they make a little more sense to those who were not there. A second presentation I gave as part of the exhibition free seminar programme. Again, I have annotated some of the screen shots. This is a presentation I gave as part of the Online Information conference. It is quite different from the one I gave with the same title to INFORUM in Prague earlier this year. I wish I could say it was because so much has changed since then: unfortunately very little has changed. This was a one day workshop pre-conference workshop. The slides merely formed a framework for the day. There were more services and issues discussed within the group than are shown in the presentation. The link given below, which is a direct link to a ppt file on the RBA Information Services web site, will not be available indefinitely. The presentations on my social media page are updated every time I run a workshop or give a seminar on the topic. Facebook trying to take over our browsers? So Facebook now wants to take over our browsers. When I want to see what my Facebook friends are doing I will decide how and when to do it – not Facebook. Needless to say I have not done as it suggests. I did wonder why the Firefox message is not so explicit. I initially thought that it might be an add-on, but dragging something to your home button is, obviously, going to make it your home page. I have a sacrificial laptop in the corner of the office; I shall experiment tomorrow morning unless someone alerts me before then about dire, irreversible consequences. UPDATE 5th December 2010 7.17 am: (Yes, I know I shouldn’t be awake at such an ungodly hour on a Sunday- blame the cat!). Just tested the Facebook home page button and it does seem to just make your Facebook page your browser’s home page. It is easily undone. An interesting move, though, by Facebook to encourage users to go straight to Facebook when they wake up. Don’t many of them do that anyway?